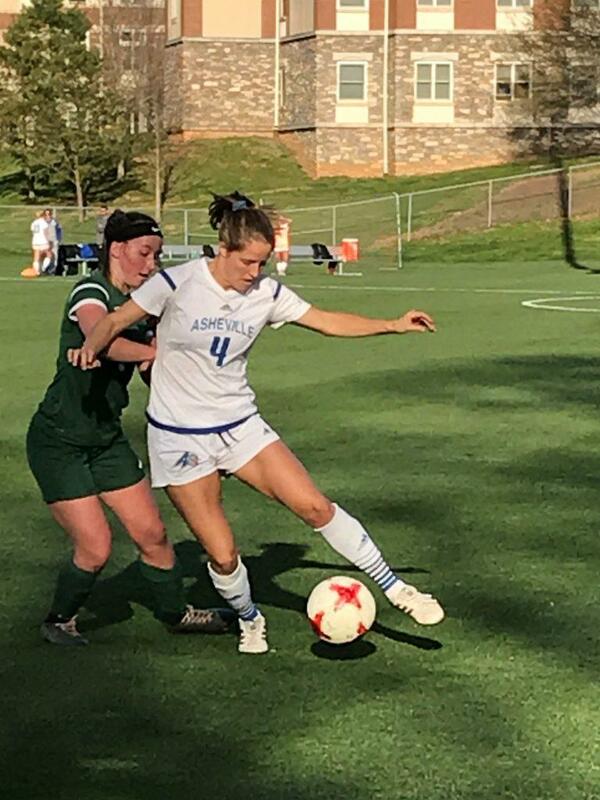 Despite a wide open first 10 minutes in which the Bobcats of Lees-McRae College came close to scoring, UNC Asheville’s women weathered the storm and went on to dominate the rest of the match, winning by a final margin of 3-0. The Bulldogs struggled to find their rhythm early in Thursday’s match and could have found themselves down had it not been for excellent communication and understanding between junior center-backs Ellie Stone and Maura Coolbaugh and freshman goalkeeper Bryson Lee. “Being involved through other people, talking to them and being indirectly involved in the play keeps you mentally there,” Coolbaugh said. After an end-to-end first 15 minutes, the Bulldogs settled in and began to dictate play, leaving a bewildered Lees-McRae chasing the game for much of the match. Junior midfielder Alison Kurucz opened the scoring in the first half when she got onto the end of a through ball and took on the last LMC defender. Kurucz faked a left-footed shot from 20 yards out and drove the ball into the top left corner with her next touch, giving the goalkeeper no chance. After the goal, the Bulldogs began asserting their dominance as Kurucz along with freshmen Skyler Chillson and Emily Dueñas began finding pockets of space in the midfield allowing them to open up the LMC defense with creative passes. “I thought Skyler Chillson was really clean on the ball tonight. Her work ethic, hunting the ball when she didn’t have it, her turns on the ball and then her dribbling speed was really good tonight,” said Michelle Demko, head coach at UNCA. Chillson, who scored both goals in a 2-1 win against Western Carolina University Monday, looked unstoppable at times. She created numerous chances for her teammates by dribbling at opposing defenders fearlessly and putting in a number of dangerous crosses. The midfielder nearly put the Bulldogs up 2-0 when she just missed a rebound attempt following a great save from the LMC goalkeeper. Despite dominating both possession and scoring opportunities, the Bulldogs went into halftime with a narrow 1-0 lead. UNCA came out of the halftime break looking even more dominant as everyone looked comfortable in possession and hungry to score. Rarely was the ball in the Bulldogs defensive half of the field. UNCA shared the ball extremely well in the second half. Their play was sharp and the Bulldogs did not hesitate to use their goalkeeper to build possession from the back. Every touch and pass was purposeful whereas LMC players often looked unsure where to go with the ball during their brief spells of possession. After senior forward Caroline Houser put UNCA up 2-0 the Bulldogs never looked back. They threw numbers forward in possession and even when they lost the ball, their smothering team-defense made it difficult for Bobcat players to connect passes and retain possession. “Everyone did really well, but Erika stood out to me. She was making a lot of runs and never seemed to stop and was really strong in her tackles,” Chillson said. Sophomore left-back Erika Snyder looked extremely lively in the second half. She made frequent overlapping runs and her willingness to get forward made it impossible for the LMC defense to cope with both her and Chillson. The duo put in a number of dangerous crosses in the second half. As the game slowed down senior midfielder Courtney Naber ensured the Bulldogs never lost their way. She played a deep-lying midfield role and did an excellent job of linking up play between the defensive four and the more attacking players. “The focus in talking before we played was speed of play, dictating tempo and using the wide flank channels in the final third,” Demko said. Naber’s second half performance surely pleased Coach Demko as she effortlessly controlled the tempo of the match and frequently switched the point of attack by picking the ball up on the left side of the pitch and finding the feet of a teammate on the right side of the field and vice versa. Her ability to control the match was rewarded with a spectacular left-footed goal from 25 yards out. In the five minutes before her goal, she nearly scored twice but was denied by the crossbar and a heroic save by the Bobcat goalkeeper. “Courtney’s goal was beautiful, that was my favorite of the night,” Coolbaugh said. Naber’s goal was the last of the night and capped off an impressive win for the Bulldogs. They will look to continue this form when they take on the Terriers of Wofford College April 12 at Greenwood Field. While the spring is technically the off-season, Coach Demko and the Bulldogs are not taking it lightly. Thursday’s display was nearly perfect and an obvious sign the team worked hard in training. “It gives us an idea, personnel wise, going into the fall. We are adding ten freshmen so the spring season is an opportunity for us to have more of a training rhythm. In the fall you have four games in nine days every week. Now is really an opportunity for us to get everybody on the same page and establish some sort of rhythm and individual growth,” Demko said.